It's August 4, 2010 and the girls are 7 1/2 weeks old and chomping at the bit to get out of their horse trough! I feel so bad leaving them in there as Hubby works on the coop. 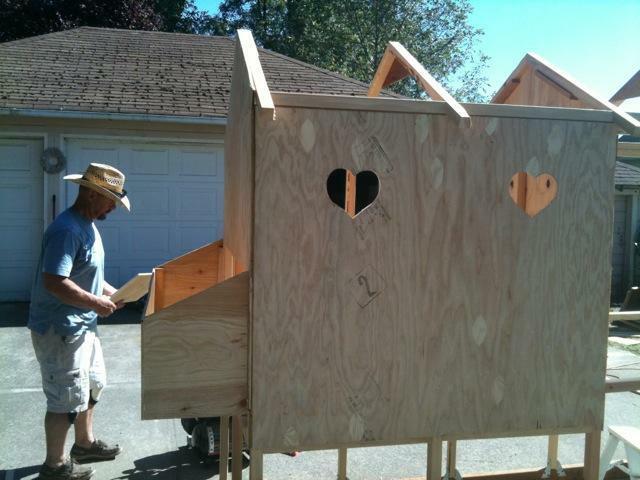 The good news is... we're working on the coop! 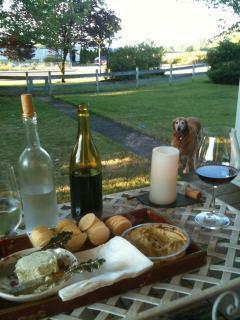 We still have plans to move to the vineyard but we just don't know when at this point. 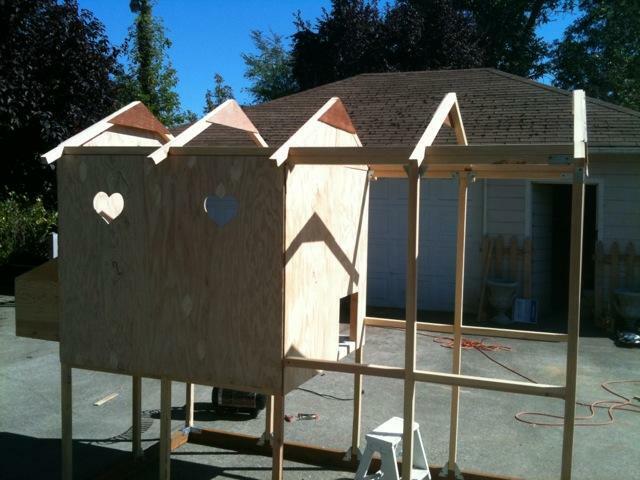 We need to build our own home before the chickens get theirs. So in the meantime, we've decided on a little smaller version of the palace they will have some day. We thought we would make a little Coopalita for them, and then by the time they were full-grown move them into the larger space. I thought if we just made Fred Dunn's little tractor coop a bit larger, it would work for a couple of months at least. so excited to get the girls into their new "spacious" temporary home. Maybe tomorrow! Would love to leave it with the fancy floor, but sure know that wouldn't last long. We'll use the same thing we used in the brooder, pine pellets with a sprinkling of hay that I felt was easier to clean and they loved to scratch. There's hay in the run right now, but we'll be changing to sand soon. Just wanted to get the girls into their new digs without any further delay! 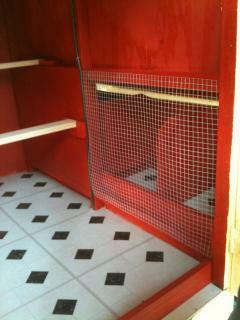 The red boards in front of the double door, pop door and laying boxes remove for cleaning. 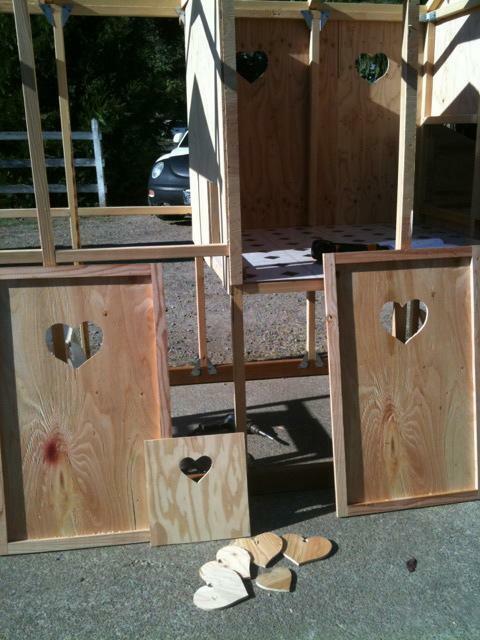 Also the roosting boards (1 x 3") remove easily. There is a light in the center. 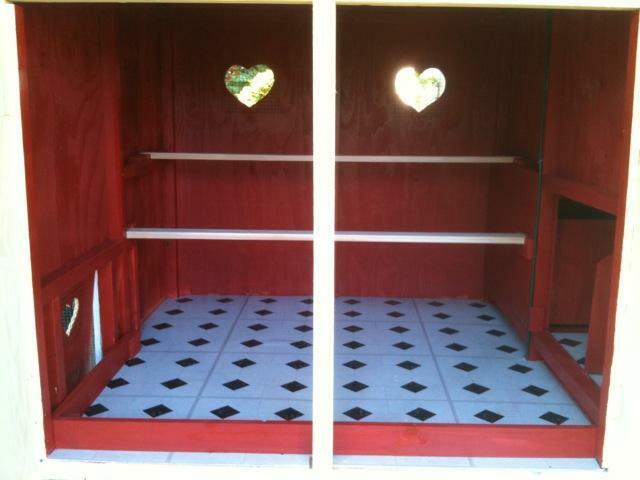 Closed off the nesting boxes until the girls learn that they are not for sleeping. We put them in there just tonight and although they liked the corner a bit better at first, I visited them three times and put them on the roost. By the fourth visit, they were all snuggled together on the lower one. I think they like it! 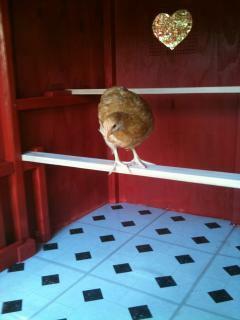 Miss Lucette checking out the coop and roosts before we introduce the rest of the ladies. Figured if she was okay with it, they would follow suit. They did! The little screen door under the double doors. Thought it would be nice to have more access to the back of the run so added this one into the plans. Easier to reach the large water bucket too. Hubby surprised me with the outlet (in case we ever need a fan) and dimmer switch right there at the corner of the coop under the laying boxes. 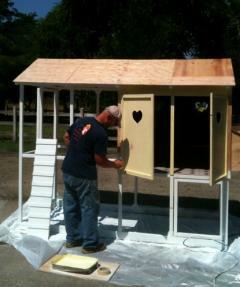 Putting the finishing touches on the Coopalita! 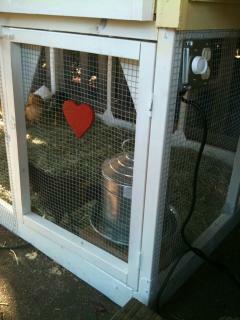 The girls were already inside the run and loving it when we were pounding away on the inside of the coop. They would stop, look, listen then shrug and go about their business. They were SO happy to be out of the horse trough! And finally, an end to three busy busy days... 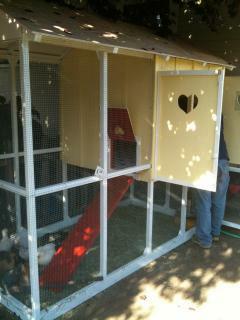 Thank you to my wonderful husband for working so hard on this for my girls! And here we are 2 days later. The girls are loving it. I didn't need to worry that the slats weren't close enough or the roosts too high for the little one. The first night they slept on the lower roost but the second night they were all on the top one...8 girls squished into 1/2 of a 4 foot roost. The next day they were spread out. I'm glad that we went with the 1 x 3" boards for now. There's no mess on the boards and all the poo is in a neat little row on the bottom to scoop up. (Did I mention that I liked hearts? 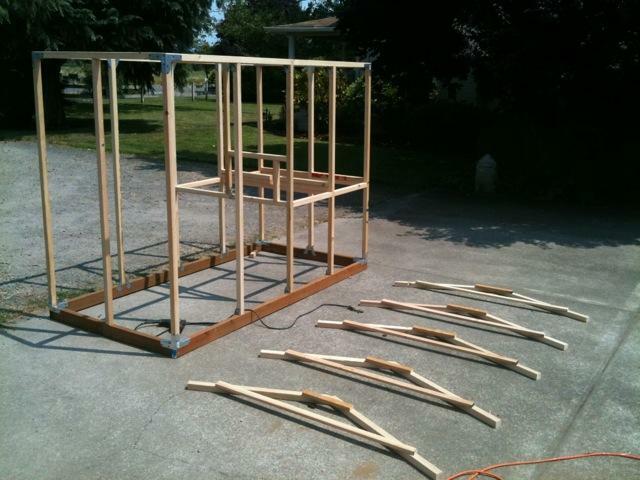 That's something quite similar to what I would like to build (or help my dad build, lol) for my six pullets! It doesn't seem too complicated, which is a plus. And I like the shingles, because when it rains it gets LOUD on metal roofing. 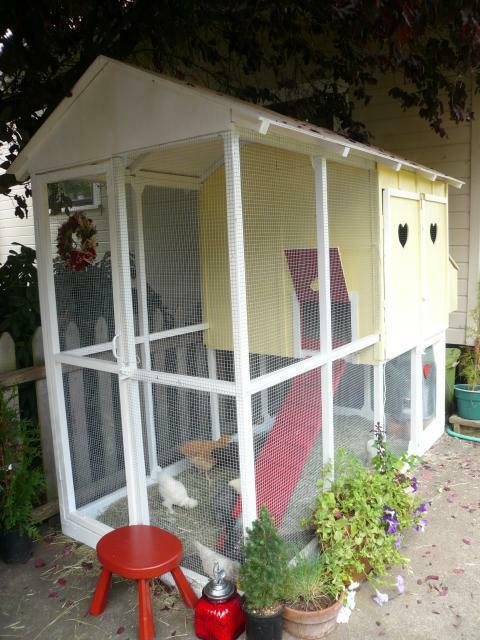 And another thing I really like about your coop is how it's raised; that's great for shade for the chickens underneath it on hot days, and leaves more space for them to run around in in the run! And one more thing to point out: I like how the run is covered, so it shouldn't be too messy when it rains, and that way it ensures your chickens can't fly out. 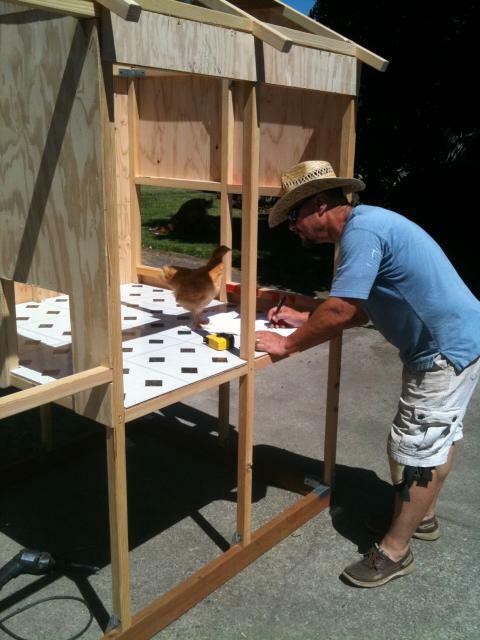 This is such a great coop example for beginners who know how to build things, and wanting to build their own coop for their new chickens! Cute coop! I did not try to follow the link to the plans, so, I hope they are still there! What would you change if you had it to do over again? Did the plans link include costs and a supply list? Thanks Twins! I have to say, that 5 years later, it's still standing up pretty well. Needs a good cleaning though, which is the plan on the next extremely hot day. Only one lovely lady left from the original 8, but they were sure my favorite chickens ever. Been through a couple of accidental Roos and do not ever want that again! Now I'm up to 16 girls and one big, gentle Orpington roo. Finally not afraid of my chickens again, but do think about that first group of girls and what they've taught me over the years. Also, that sand in the pen... Priceless! A little late answer here. The coop is 4 x 8. 4x4 for the coop and the rest is pen. 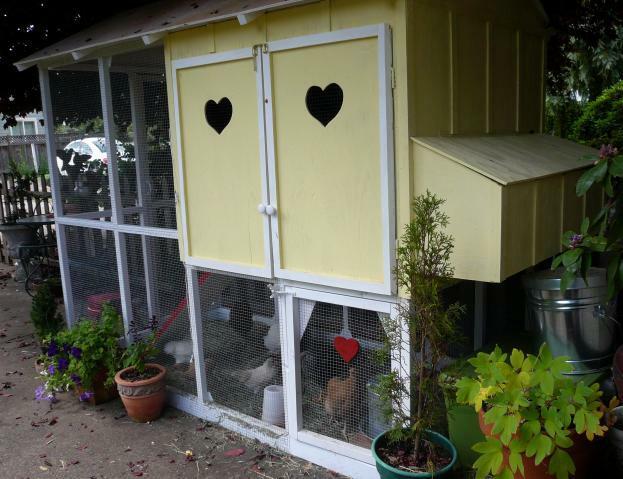 It sure doesn't look as clean and pretty on the inside any more, but that comes with silly chickens! We moved the whole thing on a truck to the vineyard two years ago and built a 12 x 12 enclosure with hardwire on the carport. Covered the whole thing with sand that is wonderful! Then we opened up the end of that so they are let out onto a grassy yard for exploring. We lost Zoe last year to a crafty coyote. Fixed that. This year, a hawk got Skittles. I can't say it's impenetrable now, but so far so good.